Written by Mark Faggiano on December 28, 2015 Blog, Physical goods. 45 states and Washington D.C. all have a sales tax. It’s remitted back to states and local areas to pay for things like public safety, roads, and other state budget expenses. Sales tax is governed at the individual state level, so tax rules and regulations are slightly different from state to state. A handful of states are fairly simple. They have one statewide sales tax rate, which generally ranges from 4-7% — meaning you only need to charge that single rate when you have nexus. Example: You’re a seller of sci-fi memorabilia living in Connecticut. Since you live there, you have sales tax nexus in that state. Since Connecticut only has a statewide sales tax rate and no local rates, your life is simple: you charge the 6.35% statewide sales tax rate on all sales. But… most states make life a lot more complicated. They not only have a single statewide rate, but also allow local areas to tack on additional tax rates. It’s for this reason that you may end up charging your customers some combination of a state, county, city, and “special taxing district” taxes when making a sale. Example: You sell skincare products from your home in Obetz, Ohio. Ohio is an origin-based sales tax state (more on that in just a second), so your sales tax rate in Obetz is 7.5%. That’s made up of the 5.75% Ohio state sales tax rate and the 1.75% Franklin County rate. As you might have guessed, this can get even more complicated if you sell or have nexus in an area that has sales tax, county tax, and city tax. Then there’s another wrench to throw into the equation. When it comes to shipping products, some states are origin-based sales tax states and some are destination-based sales tax states. This can also affect whether or not you charge tax, and how much you charge. Where you live can have a huge impact on what you charge. Let’s go over this in a little more detail. Origin-based sales tax is fairly simple. If you have home-state nexus in a state (i.e. your company is based there) and you sell a product to a buyer in that state, you pay sales tax at the sale’s point of origin (i.e. your location). * – In California, state, county, and city taxes are based on the origin, but district taxes are based on the customer’s location. This is the only state with this rule. Example: You live in Irving, TX but make a sale to a buyer in Archer City, TX. Even though you’ve made a sale to a person in an entirely different taxing jurisdiction, you would still charge them the combined Irving sales tax rate of 8.25%. This rate is made up of the 6.25% Texas state rate, plus the 1% Irving sales tax rate and the Dallas Metropolitan Transit Authority (MTA) rate of 1%. An example of origin-based sales tax rules in effect. 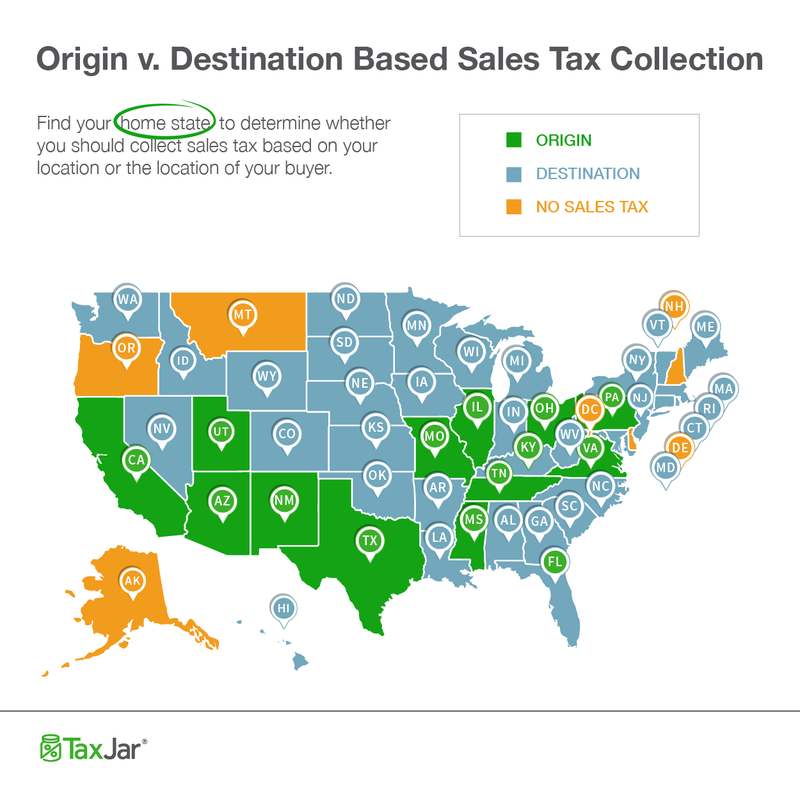 Destination-based sales tax states are more complicated, and also more common. In these states, you charge sales tax based on the rate at your customer’s location (that is, their “ship to” address). Example: You operate your business out your warehouse in Stamford, NY, and sell an item to someone in Buffalo, NY. Since New York is a destination-based sales tax state, you would charge sales tax to your buyer based on their rate of 8.75%. That’s the 4% New York state rate plus the 4.75% Erie County rate. A destination-based state requires you to charge the customer’s tax rate, not your own. As you can see, charging sales tax is a little more involved when you’re trying to charge tax to buyers in a destination-based state. 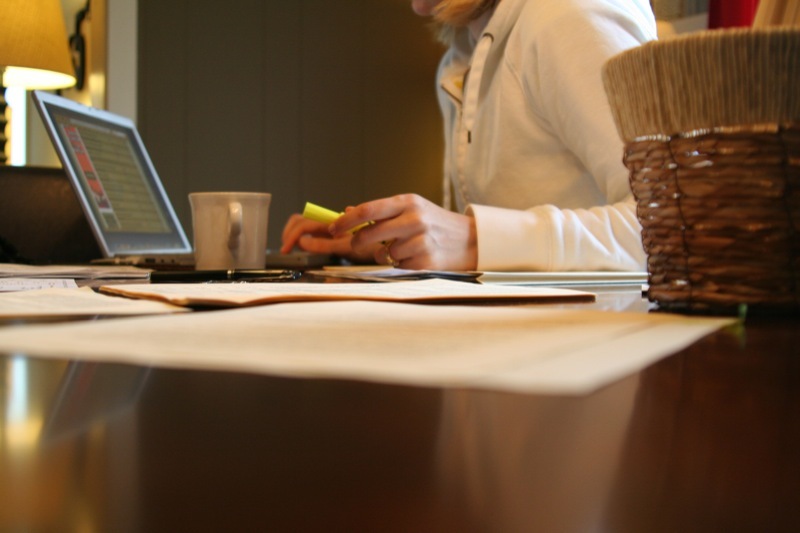 One other important consideration has to do with being a remote seller. A “remote seller” in sales tax terms is considered someone who has sales tax nexus in a state, but isn’t based in that state. This would happen if you had a warehouse, remote employee, etc. Most of the time that this happens, destination-based tax rules apply. How the tax rules work for remote sellers. Example: You live and operate your business in California but have hired an employee in Missouri. This means you now have sales tax nexus in both California and Missouri. Missouri is an origin-based sales tax state for in-state sellers, but in this case you are considered a “remote seller” since you are based in California. Since you are a “remote seller,” Missouri’s origin-state sales tax rules don’t apply to you. So if you were to make a sale to a buyer in Missouri, you would charge that buyer sales tax based at their local sales tax rate — that is, using destination-based sales tax rules. If you live in an origin-based sales tax state, charge sales tax to same-state customers at your local area’s total combined sales tax rate. 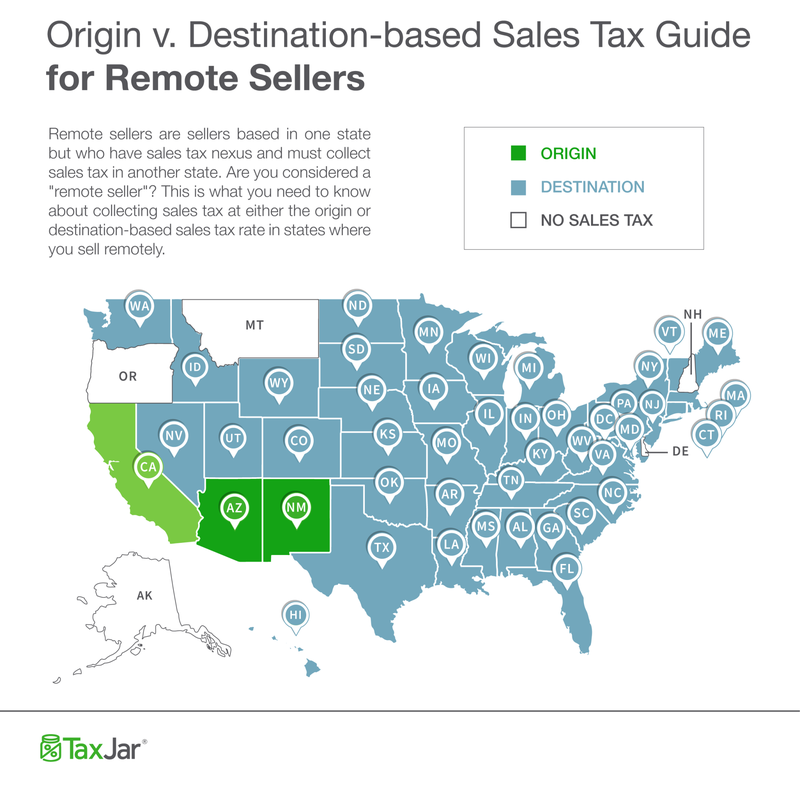 If you are considered a “remote seller” in an origin-based state, you’ll probably be required to charge sales at the total combined sales tax rate of your customer’s location. This isn’t easy stuff to grasp on your first try, so check out this post for more than you ever probably wanted to know about origin-based and destination-based sales tax. One other thing to consider is that many states also require sales tax to be charged on shipping and delivery costs. Example: You have nexus in Rhode Island, a state that considers shipping taxable. If you sell a $10 item to a customer and charge them $2 for shipping, then you would charge the applicable sales tax rate on the entire purchase. On the other hand, some states, like Alabama, do not consider shipping part of the taxable transaction and therefore the shipping charges are not taxable. So if you ship the latest must-have toy to a buyer in Alabama for an item price of $19.99 plus $5.00 shipping, you would only need to charge sales tax on the $19.99 item price. ** – For these states, if shipping and handling fees are combined, shipping is taxable. However, if they are listed and charged separately, they are not. If you have nexus in a state not listed above, you should be charging tax on your customers’ entire purchases, including the shipping. Find out more about sales tax and shipping here. This stuff starts to get complex fast. Fortunately, there’s the WooCommerce Sales Tax Automation plugin from TaxJar. This plugin will ensure you charge the right amount of sales tax to every customer, whether it’s origin-based sales tax, destination-based sales tax or taxable shipping. Need to lean on a plugin for determining taxability in shipping, etc. What about help with filing my sales tax returns with the state? As many sellers come to find out, collecting the right amount of sales tax is just the beginning. Once you’re cart is setup, you’ll then need to choose how to remit the sales tax you’ve collected back to the state. Hire a sales tax accountant to help you manage everything for you. Choose a recommended WooCommerce partner, TaxJar, that can fully automate everything for you. TaxJar will connect directly to your WooCommerce store (and anywhere else you sell too in case you sell on Amazon or another marketplace). Next, they will import your transaction data into a single sales tax dashboard organized by the amount collected. This is helpful to eCommerce merchants because you’re able to see the full picture of your sales tax in every state at one glance. Once your dashboard is connected, you can then choose how you’d like to manage your filings. You have a choice to enroll in AutoFile where TaxJar will submit your returns to the state every time they are due, or handle them on your own. With AutoFile, everything is done for you. You simply enroll once and you never have to worry about filing again! No more remembering your state’s confusing login and password or overlooking a due date. TaxJar will even submit your sales tax payment to the state along with your filing. It’s that simple. TaxJar offers a FREE 30-day trial to all WooCommerce merchants, so if you’re tired of messing with spreadsheets or remembering when you have a due date to file, lean on TaxJar and get back to growing the business you love. Do you have questions or comments about charging sales tax to your customers? Or need some clarity on how to tell if you’ve got those rates right? Start the conversation in the comments — we’d love to hear from you. What tax should I allow for if I’m selling access to my online training course and I’m based in New Zealand? How would I set this up in woocommerce? Hi David! The advice in this post pertains to physical products being sent throughout the US. However, if you’re selling to overseas customers and/or selling a mixture of physical and digital goods, it’s always a good idea to consult a tax professional to be 100% certain you’re charging the right rates.